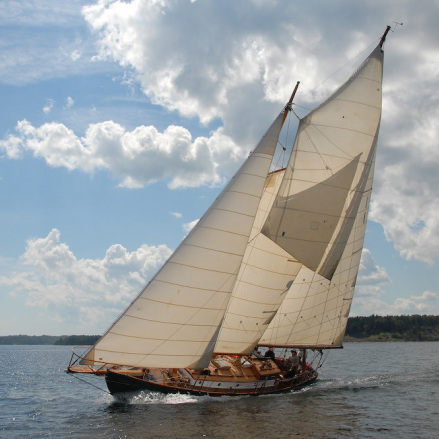 Hebridee II, a William J. Roué designed schooner, built in 1953, was donated to the Nova Scotia Museum over four years ago. Since then, the vessel has been meticulously restored in the boat shed at the Maritime Museum of the Atlantic by our Curator of Small Craft Conservation, Eamonn Doorly, with assistance from staff and volunteers. Throughout the restoration project, key milestones have been celebrated at the museum, providing opportunities for the community to engage in Nova Scotia building traditions and our vibrant sailing heritage. The official event celebrating Hebridee II’s completed restoration, re-launch and re-christening happened at her former berth at the Royal Nova Scotia Yacht Squadron on Friday, July 14, 2017. Maritime Museum of the Atlantic staff are eager to re-introduce Hebridee II to the sailing community and provide new opportunities for visitors to have hands-on learning experiences with small craft. Sea trials will begin in mid-to-late July 2017. More images on our Facebook.